Our last trip to Israel end of August 2014 (already seems so long ago) inspired me to write this and this story. Please click, I am very proud of both writings. The ten days we spent in Israel were so much more than I have shared yet. This is the third out of four installments. Fruit shakes (above) and pure ruby red pomegranate juice, among other freshly squeezed juices, are very popular stands, strewn throughout Israel. You might have gotten a glimpse on Instagram of the best pain au (x) raisin I had at Dallal Bakery (not the restaurant by the same name on the corner), situated a couple of doors up from the restaurant in the pretty alley framed with bougainvillea (photographed above). The bakery is snuggled among upscale boutique shops in this touristy, yet quaint and picturesque, neighborhood in Tel Aviv. We made an excursion mid-way through our stay in Israel to Beer Sheva, in the south, to re-unite with my nephew who we hadn't seen since he was maybe, five?! Long story. 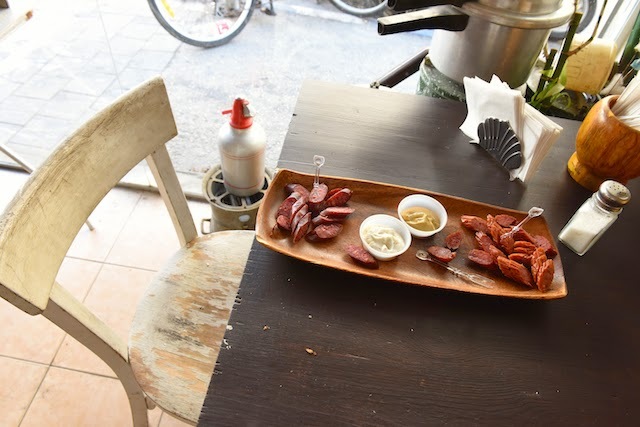 We had delicious, mine spicier, sandwiches at Saba Jepeto in Beer Sheva. Saba Jepeto is a whimsical play on words...grandpa geppetto as in the tale but it's really Ciabatta after the Italian bread they use for the grilled and un-grilled sandwiches. Beer Sheva generally speaking is yet to woo me when it comes to food though. Being sluggish paid off as we reached The Dead Sea right before sundown. These beautiful colors at sundown were captured by my talented and incredible 18 year old nephew. Do you see the ridge of mountains on the Jordanian side just beyond?! The baklava photo above really reminded me of the photograph of the African immigrant fish monger at the Market in Beer Sheva, in southern Israel, I took back in 2012. Love this humble and happy, always smiling fellow. 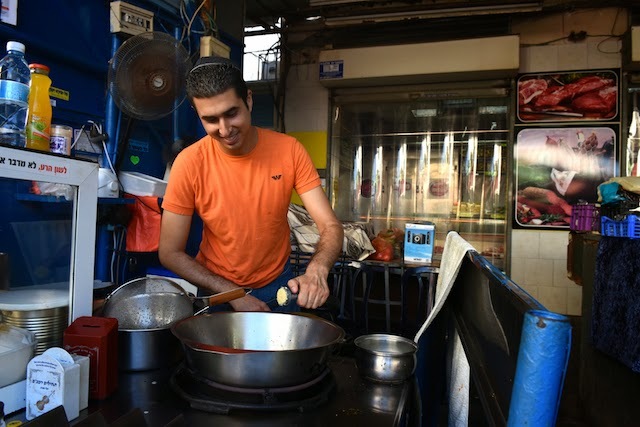 This falafel stand was passed on to him by his father. He credits the success to his mom's traditional falafel recipe. He was so pleased when I told him I have written about him before and referred so many tourists (I would like to think) to him. Even if his business depends on the locals waiting in line at lunch time he was appreciative. You can see the mouth watering image of the falafel in the pita here. 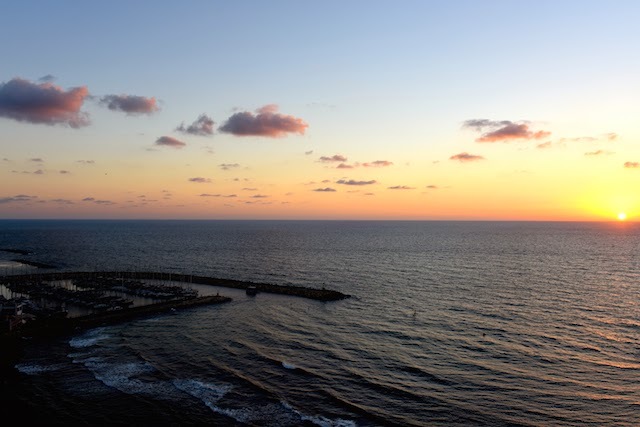 The sunset photo above and the photo of the Hilton Beach and the marina remind me that the brunch with sweeping views of the Mediterranean at Manta Ray right on the beach towards Jaffa was such a treat. The shakshuka there isn't shabby either. We had such a pleasant gathering with some wonderful foodie friends there. Surprisingly it's been my first time to the Levinsky Market (ever) in southern Tel Aviv (above and below). 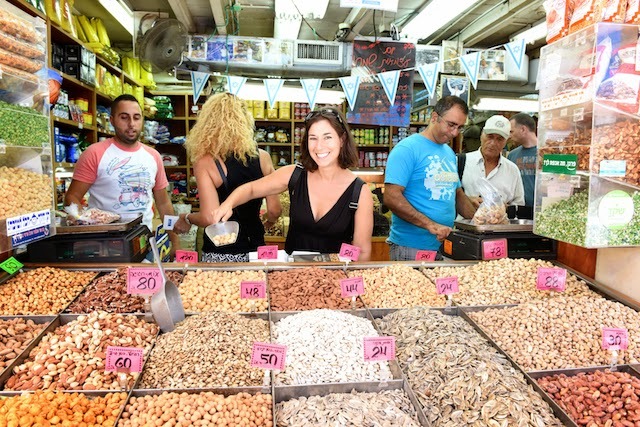 If it weren't for Inbal of Delicious Israel, I would have never made it there to begin with. I kept canceling my excursion with her, but thankfully she wouldn't hear any of it. When we arrived at the market she said "Shulie, if you came here on your own you would say eww and leave, right?" I nodded, yes. Shuk Levinsky was a treasure trove. I am happy I didn't come on my own. I have written about the artisanal soda pop shop I adore here but Levinsky market has, spices, nuts, cured olives, meats and stuffed grape leaves stands, to die for burekas and so much more. But....let me back up a tad....our first meal in Israel, right after we landed and got situated at the hotel was a couple blocks walk inland from the beach on Ben Yehuda St. We headed to one of my favorite restaurants in Israel, Shila restaurant. I have written about Shila in 2012 for the Washington Post. It is a chic, happening modern seafood place that is just as excellent today. Another night we went with my niece who stayed with us for two nights to a more humble fish restaurant just across from Shila, called Barbunya. Love those type of places. Israel has many of these fish restaurants that serve a myriad of complimentary super delicious mezzes and the fish is good too. Jonathan and my niece took a bike ride later that evening on the promenade on the beach all the way to Jaffa just to the south. Speaking of fish, I couldn't leave Israel without paying a visit to my favorite fish restaurant, Idi Seafood, in my own hometown, Ashdod. My mom thought it was fancy and questioned how can people afford to dine here day in and day out. While Idi is on the more expensive side, a business lunch menu is more reasonable. Tucked away in an industrial part of town, Idi's interior is more nautical tsatzske (tzatzke) than fancy, I think. They know how to grill fish like no other place I know. Love this post! :) I went to Israel in 2010 and fell madly in love with it. Didn't get to spend much time (just an overnight) in Tel Aviv, but your post makes me want to go back and enjoy for longer. Amazing country and people! It has been a few years since I visited. 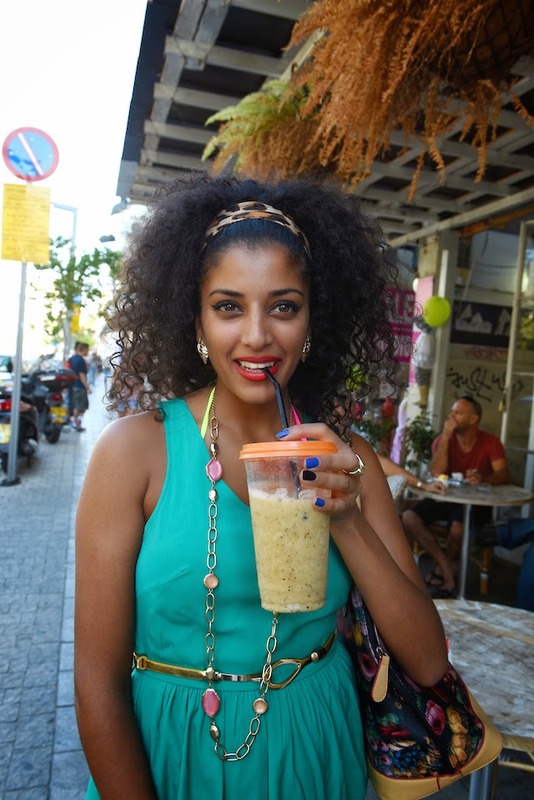 Most of my time is always spent in Jerusalem so I now want to see more of Tel Aviv. Envious, Shulie! Funny, this time we didn't make it to Jerusalem at all! A lovely place to visit! Your niece is beautiful. Thanks, Rosa. It's quite an experience walking around with her. The guys, you know, but she is so humble and nice. Thanks for sharing...A once in a lifetime trip! Awesome! Thank you for giving me a little taste of this wonderful place. I love learning about new places that I probably won't get to! 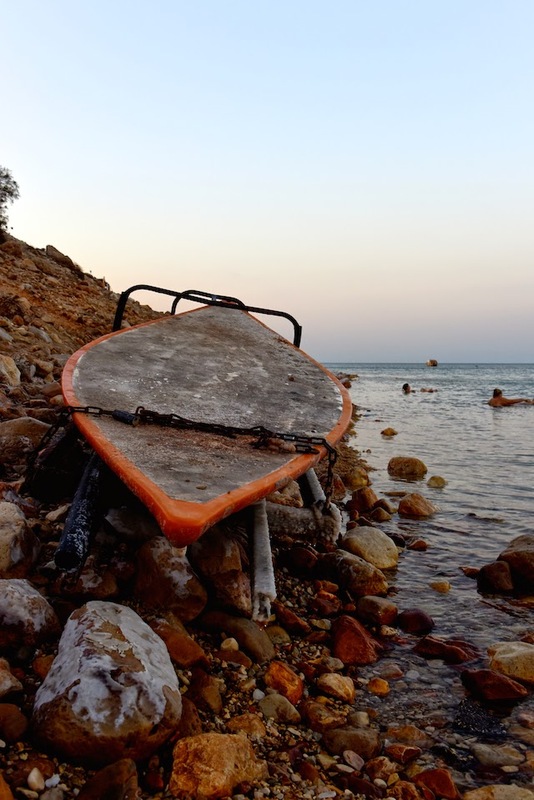 Another wonderful travel post with awesome photos! Thanks for sharing! So weird. I was just thinking yesterday that is one place I would just DIE to go! Maybe it's a sign?! I love all your photos and your niece should be a model, she is beautiful! 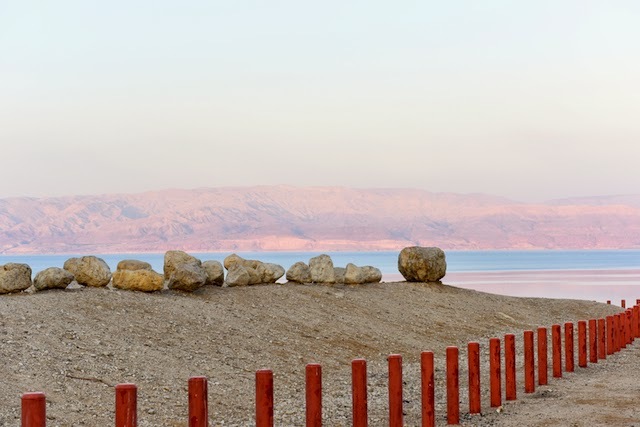 I always enjoy reading about your travels to Israel, Shulie! I hope to be able to visit one day myself. Israel looks fantastic, it's just beautiful! I love the baklava photo and the sea! 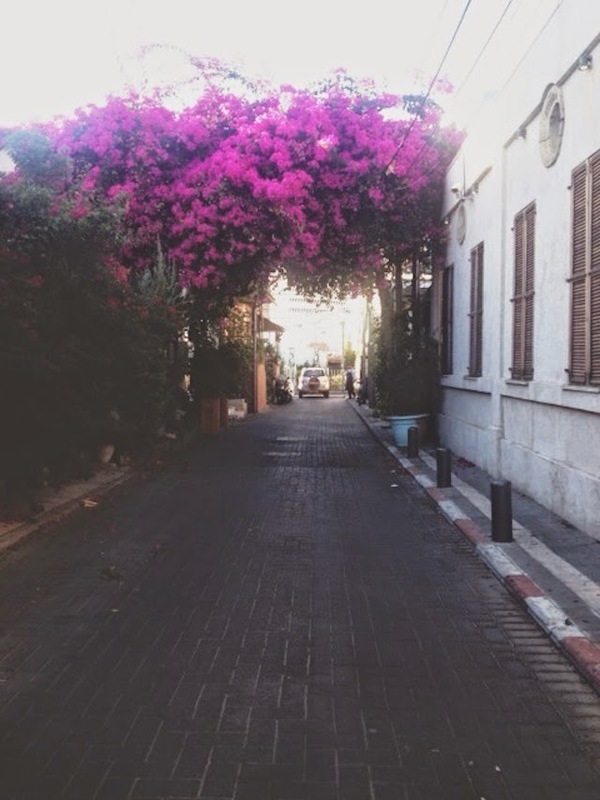 Israel looks amazing, I never would have put that on my travel list but your post has changed that. Simply spectacular.